This is a guest post from Ellie Harmon, a PhD Candidate in the Department of Informatics at UC Irvine. Ellie thru-hiked the AT in 2008 and the PCT in 2013. 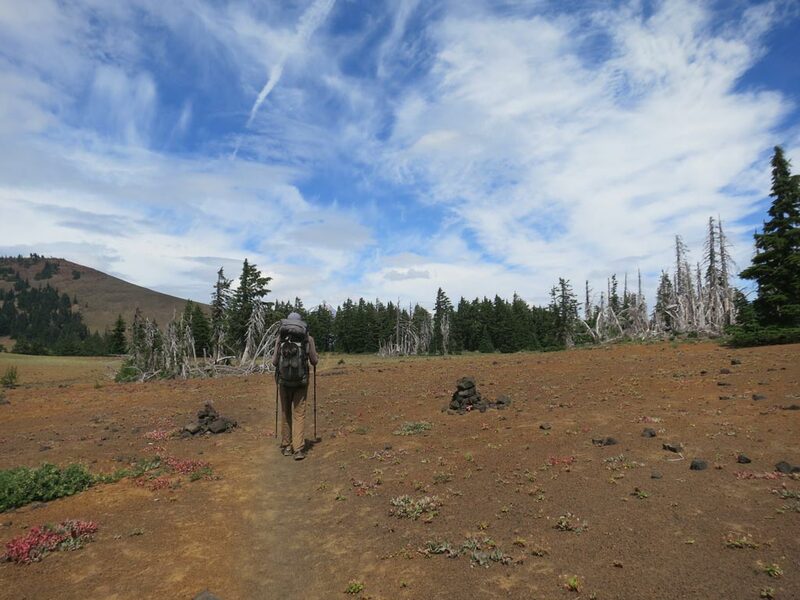 In addition to Dirt: Biogeography of the Pacific Crest Trail, Ellie’s time on the Pacific Crest Trail was part of her research on connection and dis-connection in our modern, smartphone enabled world. 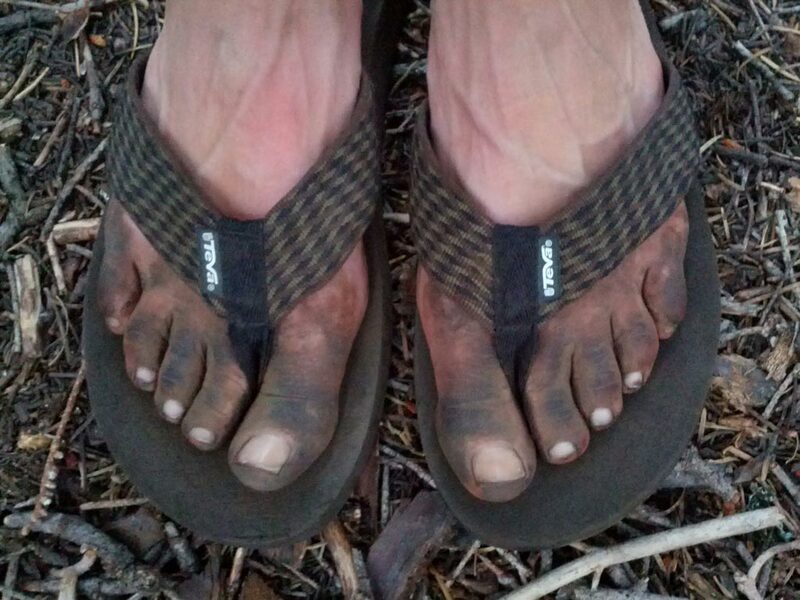 If you’ve spent some time on the PCT, you’re probably familiar with this situation: being covered in dirt. Have you ever wondered what’s in that dirt? It turns out a single gram of rich soil can contain up to two billion bacterial cells and 18,000 unique genomes. On my thru-hike last year, I teamed up with a friend of mine, microbiologist and artist Christina Agapakis, to map some of the microbes that live in the dirt on the PCT. As I hiked through the state of California last year, I sent her a total of 62 samples of dirt. These samples covered a variety of landscapes — deserts, mountains, water sources, and burn zones. Upon returning home at the end of my hike, we met at Christina’s lab to carefully weigh out just one quarter of a gram of each sample, extract the DNA, and send it to a specialized lab for processing. The lab then amplified and sequenced all the 16S RNA genes in the sample. 16S RNA is a part of the bacterial ribosome, a sequence shared by all bacteria that is commonly used to identify closely related species. They then sent us back a huge amount of data about what species were contained in each sample. You can explore some renderings of this data at our website dirtmap.org. Click on one of the images of dirt to see what kinds of bacteria we found in it. We also recently put together an exhibit for the UCLA Art|Science gallery. You can read more about the details of our process and the art exhibit on Christina’s blog. 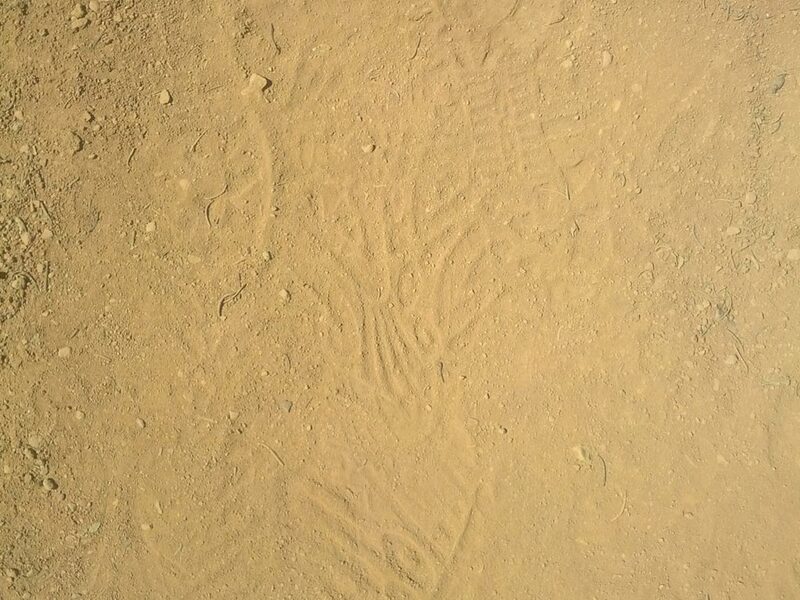 This image shows different ways we might represent 6 samples of dirt, which vary in their texture, color, and composition as we can see in the top row. 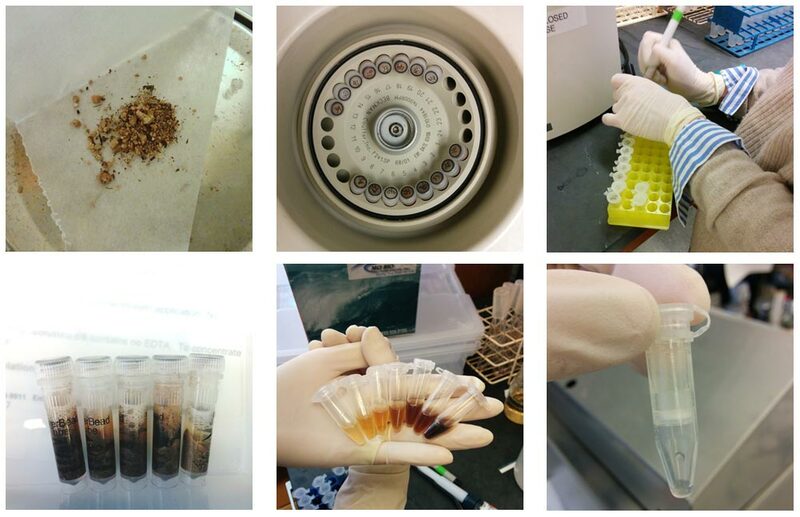 The second row contains the plates for these six samples which shows what kinds of things bacteria grow from these samples in a lab environment. The third row contains representations of the different bacteria identified through DNA sequencing. Each circle represents a species of bacteria. The circle’s size is based on the abundance of that species in the sample. Circles are color-coded based on which phyla the bacteria belongs to — so ‘similar’ bacteria are similarly colored. This gives a different picture of the diversity of the soil samples. For us, this project has been a way to explore the limitations of various representations of microbes in the biological sciences. When we create cultures of a particular soil sample, what we really see are the ‘weeds’ of the science lab — only those bacteria that grow well given the ‘food’ supplied on a Petri dish, those bacteria that grow the fastest and can take hold before other species, those bacteria that are comfortable in the climate (e.g., temperature, humidity) of the lab. When we sequence the genomic data, we see many more species in a given sample. Yet, this data has its limitations, too. DNA sequences which don’t match species identified in NIH databases are invisible in final results, clustered into a single ‘No Hit’ category (well over 30% of our samples in many cases). Different sequencing machines give wildly different results (see this post on the thru-hiker relevant topic of poop bacteria). And bacteria are unique creatures. Unlike many other living creatures, they sometimes exchange small bits of their genetic material outside of reproductive processes (Wikipedia has a good explanation of this phenomena, which is called horizontal gene transfer). So, what does it mean that a particular bacteria’s 16S sequence ‘matches’ another’s sequence — are they the same species? Or did they just exchange a part of their DNA? Christina and I are now in the process of putting together an of atlas of California dirt and a guide to the microbes that live in it along the PCT. As a member of the PCT community, what are you curious about? What do you want to know about dirt? Email me or post your comments to the PCTA Facebook page. ** This project has been supported by a grant from the University of California Institute for Research in the Arts. As the Trail Information Manager, Jack works to connect people to the PCT. He's involved with a wide variety of projects that help the trail, the trail's users and the community that surrounds the experience. He has thru-hiked (Pacific Crest Trail in 2006; Colorado Trail in 2008; Continental Divide Trail in 2010) and is an obsessed weekend warrior.